The familiar figures of Fred Astaire and Gene Kelly provide a fine example of two very different movement styles. In the picture above, a moment frozen in time, Fred Astaire embodies lightness with a sense of space and grace. It is as if he were suspended by invisible strings, weightless. Gene Kelly’s form is much more muscular; instead of taking off in flight, he seems to be ready to return to the ground. There is a sense of strength and weight about him, compared to Astaire’s airy style. Below, we see the two dancers off-stage. The difference is even more apparent. Gene Kelly rests into the seat; there is a sense of weight supported. Fred Astaire appears light; even when sitting there is a sense of the space above. Orienting is the action that precedes all other movements–the “pre-movement”– the set-up that provides the starting point for a whole sequence, such as throwing a ball, or walking, or using our keyboards at the computer. Even the most basic actions, like looking at something or breathing, begin with a fundamental orientation to gravity. Orienting is the movement we repeat the most often, but because it is “pre-movement,” before we pick up the barbell, or see any visible sign of action, its importance often goes unrecognized. The basic pattern of orientation, as we see in the example of these famous dancers, is reflected in the actual physical shape of each one’s body, as well as in each of his steps. Kelly’s pushing off the ground leads to a more muscular frame; Astaire’s floating style keeps his muscles long and lithe. *** Orienting, the movement we do the most often, shapes us. It creates or contributes to the tension and overuse of certain muscles that is often the basis of chronic pain. 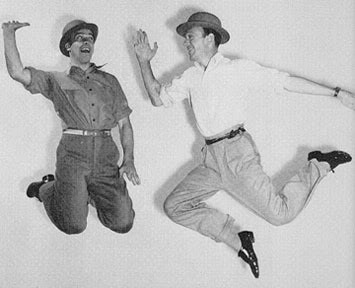 Regardless of their differences, Gene Kelly and Fred Astaire were both fabulous dancers. Although Ida Rolf had a preference for Astaire’s style, neither orientation is right or wrong. The key, as usual, is balance and awareness: Whether it is originally innate or acquired, once recognized, we can work with our habit of orientation; we can practice selecting a different perception to make up our pre-movement: We can develop such strong invisible marionette strings that we rest all the way into the ground, or we can learn to go from the ground to find the sky. *The fundamental patterns of orientation were first introduced to me by Hubert Godard in 1990. **A skit in the Ziegfield Follies, “The Babbitt and the Bromide,” provides a good opportunity for further investigation of the patterns in motion as the two dancers do the same steps at the same time throughout. ***I am not able to address the origin of the movement style–the proverbial chicken or egg issue–but I can say from experience that the shape of our bodies can change as we work with these preferences. This entry was posted in Body Imagining, Perceptual Body, Train of Thought by aline. Bookmark the permalink.